Getting 404 error because of missing Author Page in WordPress websites is a common nuisance. Let’s understand the problem and learn the solution. It’s easy! Bloggers who are using WordPress as platform for their websites often encounter the problem of author page not found (the standard “Page Not Found” 404 error). The theme they are using creates a link on the author’s name associated with every post but when this author link is clicked author page with 404 (Not Found) error code appears. And the bloggers feel totally confused about why this problem is happening and how to solve it. This is exactly what I am going to tell you in this article. Now let’s go further to better examine and understand the 404 author page not found problem. Why is the Author’s Page Missing? Once the user has been created, you can create a profile for her. The profile data you enter will get displayed on her author’s page. But WordPress has a little flaw. It allows a space in the Nick Name field of the user profile. And that is the cause of the whole issue. Let’s understand it using an example. 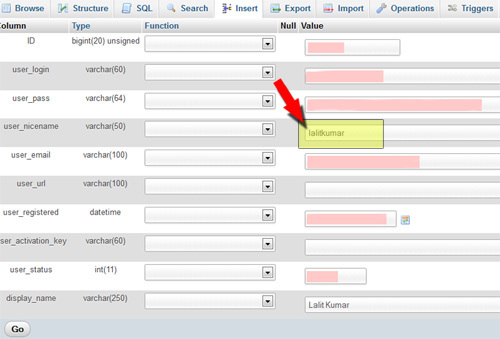 This space between Lalit and Kumar is what makes the page unavailable and throws 404 error. Valid URLs can not contain a space. Although some browsers will try to fill this space with %20 encoded character but still the URL will remain invalid. You can easily solve this issue of author’s page not found 404 error by carefully editing WP mysql database. Go to cPanel of your WP website and then go to phpMyAdmin. This is a tool that allows you to interact with the mysql database of WordPress. Once you’re inside phpMyAdmin, select your WP database from sidebar. Then select the user table. Browse this table and click on the user for which you’ve the problem of 404 error, missing authors page. Why there is no Author’s Data on Author Page? Once you’ve solved the 404 error –you may notice that when you go to author’s page –all you see is a list of post written by that author. But you were expecting to see your Author Profile details on the page –weren’t you?! The reason behind this is that your WP theme doesn’t have an Author Template (author.php) –so WordPress does not know what to show on your author page. As a result, it simply shows post written by the author. You can create a file named author.php and upload it in wp-content/themes/your-theme directory. Content of this file will be used to render the author’s page in future. I hope this information was useful for you and saved you some time. For keep on receiving great tips on WordPress, Blogging and making money from blogging, do subscribe to my newsletter. Happy blogging! I have another kind of problem. In General setting “Anyone can register” is unchecked as well as “New User Default Role” is set as Subscriber. But today when I checked my Google webmaster, I noticed many people have made author pages by their names and those pages are jumping to 404 error. They are not associated to my site. I handle my blog with only three authors. Can you tell me how to stop people to make themselves as authors of my website. How can I delete all undeserving authors? That was a great suggestion to take out the space and/or lowercase the author’s name, but alas, it didn’t solve my problem. Nor did resaving the permalink structure fix it. I guess I have a deeper coding issue, but I swear there was a tick box somewhere that asked if it was a single author blog, but after looking, I cannot find it again. i actually was facing this issue of author page 404 error, finally fixed it and now author page is working fine. your article is too common. wordpress will automatically generates and convert the spacing into %. I am wondering if there is another issue since which the author page function is not existed in wp from sketch template. Thank you very much for pointing out the annoying user_nickname field. Thanks for the help. Served me well. Hey, thank you very much! You solved a big issue on my website! :D Clear Skies!